My oldest daughter (7) is finally at that age where she is becoming a great hiking companion. She likes to learn about different things, and is noticing things like animal tracks and signs, how to tell if a tree or limb has been sawn down or broken off, noticing old fire rings, things like that. A few days ago we decided to head out for a quick hike, and I brought a sandwich along because last time she got really hungry so we cut the trip short. This time we had a "mission" to find where a particular old road dirt road connected to a newer road. I'd seen the old road on satellite maps and wanted to find a way to get to it using an ATV, but we were on foot for this trip. As it turns out, the road doesn't connect to the new one in such a way that you can get an ATV across the 100 feet or so of rubble and sagebrush but at least I know how to get to it on foot now. 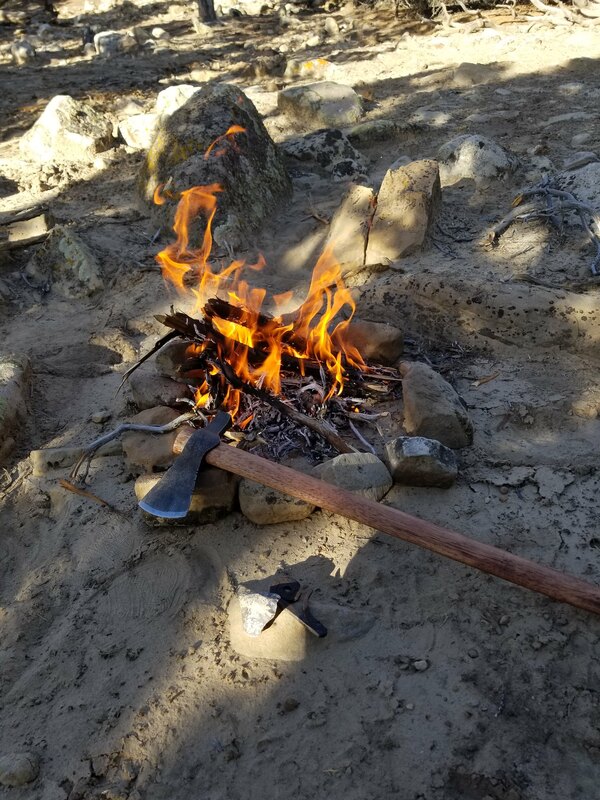 We found a suitable place near some downed dead trees and made a quick flint and steel fire. I'm ashamed to say I am a little out of practice with blowing tinder bundles into flame so I took the opportunity and luckily got one going on the first try using a jute twine bundle with an extra bit of char cloth in the middle to really give it a head start. I didn't take a whole lot of pictures but I did get this one. It was a very little fire. Just enough to show my daughter how the flint and steel works and to warm our hands while she ate her sandwich. Re: A short trip out for a sandwich and a fire. Sounds good PW! That's great your daughter is coming of age for the trips. Looking forward to seeing more. Wonderful day I would think. It's good to get them started young, thanks for taking us along. Thanks for taking us along the trail with you. Nice to hear about your hike. A fine way to spend time together. can we get some more detail on the make of that sandwich? Heh, just a ham and swiss with a little mayo and some ground black pepper. We went back to the same spot again yesterday and roasted some hot dogs. When the weather gets a little warmer I might try bringing a skillet and do some spam sandwiches with eggs on toast or something. It has been so long since I was really able to get out and do any bushy stuff. It was real nice to do these little day hikes. Boy does that sound like a lot of fun. I remember doing those things about forty years ago when my son was young and enjoyed those little outings a great deal. Nothing like sitting by the fire cooking a meal and enjoying the outdoors and your child. My son remembers them too and often comments on how good it was to share that time. Ham and cheese with mayo and ground pepper works too. I think the little trips are much more meaningful and fun. Less stressful and relaxed. Since My sister passed I've become much more involved in my nieces family. The Oldest is 16 and looked at me like I spoke a foreign language when I asked if he wanted to go hiking. They live next to the land I grew up on and can still hike when I want to. Maybe the 9 yr old? Glad you had a good trip PW plus getting the little one involved! I love that hatchet/hawk you have in the picture! The tomahawk is just a Cold Steel Trail Hawk. I stripped the paint off of it and rust blued it using instructions found online. I made a few crude decorative file cuts on it as well, and stained the handle. When they come from the factory, they have a set screw installed to keep the head tight to the handle. I discarded this screw and used a rasp, sandpaper and a little carving to make the handle fit the inside contour of the eye more closely. This allows the head to fit snugly on the handle without working loose while chopping, but also allows it to come apart with a light tap of the handle on something solid. I find it's easier to pack it around in two pieces. Works just like a pickaxe handle. Glad to hear you got some time to be able to get out, and especially that your daughter went along!! That?s awesome and times you?ll both remember. Any idea what the old road was used for? Since you mentioned using an ATV possibly, I was wondering if it was maybe an old fire control road or something similar. We have a lot of them on state property and at several parks, but most have not been maintained due to budget cuts. About the only way you can tell they even exist is from aerial pics as you mentioned. Both of the roads lead up to the head of the same canyon. At the head of the canyon are ventilation fans for an old (closed) coal mine. The old road had power lines run along it up to the fans. The power poles are now cut down, but the cables remain.